In a step that over-ruled America’s Turkish NATO ally, US jets dropped food, first aid and weaponry into the besieged Syrian Kurdish town of Kobane on Monday morning. Turkey’s president Tayyip Erdogan, in remarks made on Sunday, rejected the idea of arming the Syrian Kurdish fighters, equating them with terrorists. Al-Khaleej [The Gulf, UAE] reports that there was fierce house to house fighting in Kobane [`Ayn al-`Arab] in Syria near the Turkish border on Sunday into Monday between local Kurdish militaries and the invading fighters of ISIL. At the same time, Turkey renewed its refusal to join any anti-ISIL coalition until its demands for a buffer zone next to the Turkish border with Syria were met. Turkey expressed strong disapproval of any plan to transfer American weapons to Kurdish fighters in Syria, since they are allies of the Kurdistan Workers Party [PKK], a group Turkey and the US consider to be terrorists. 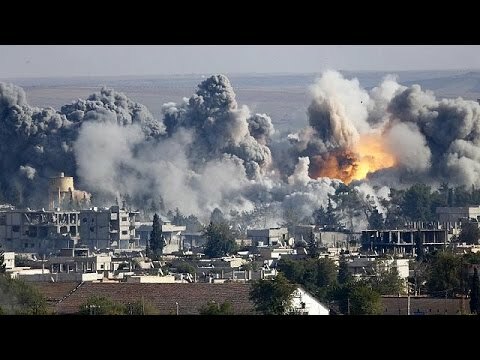 US and coalition air strikes on ISIL positions near Kobane on Sunday killed 15, adding to a high death toll for the insurgent group this past week. The bodies of some 70 fighters, likely those of ISIL, have been delivered to the national hospital in Tel Abyad in al-Raqqah during the past four days. The coalition air strikes also took out four armored vehicles that ISIL had captured. Turkey’s President Tayyip Erdogan reaffirmed that his country would not join the anti-ISIL coalition until four demands had been met. These include the announcement of a no-fly zone, the establishment of a buffer zone, a program to train and arm Syrian revolutionaries, and the launching of an operation against the Baath regime of Bashar al-Assad in Damascus. (The point of these demands is that Turkey is afraid that the current coalition air campaign against ISIL will inadvertently strengthen both the Damascus regime and Kurdish separatist guerrillas, and Ankara wants to be assured that these two outcomes will be forestalled. Erdogan also rejected calls to arm the Syrian-Kurdish fighters of the Democratic Union Party (PYD), the paramilitary of which is called People’s Protection Units (YPG). Erdogan alleged that the PYD is indistinguishable from the leftist, separatist Kurdistan Workers Party (PKK), which Turkey and the US consider a terrorist organization. The Obama administration appears to have disagreed dramatically with Erdogan, since it airlifted weaponry to the Kurdish fighters of Kobane on Monday morning.